The Favourite Review - Are You Screening? If you’ve managed to become a fan of Yorgos Lanthimos (Dogtooth, The Lobster, The Killing of a Sacred Deer), you probably weren’t expecting his next feature to be from the realm of “based on true events,” or set in the throne room of 18th century England. You also might not expect him to be directing something he didn’t write. 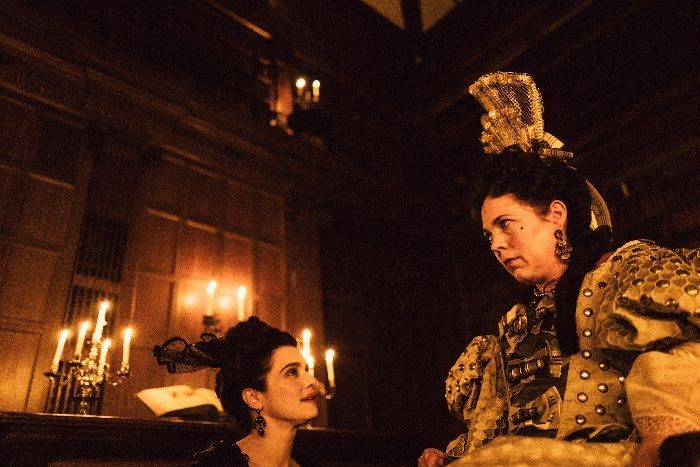 On the other hand, once you hear that The Favourite is an often bizarre, always discomforting, morality play focusing on sexuality, mental illness, manipulation and character dissection that can hardly be described without calling it “Shakespearean”, you might be reassured that we are squarely in Lanthimos country. Queen Anne (Olivia Colman) reigned during a particularly strange time in the history of Great Britain (in fact, it became Great Britain during her reign), and political parties put her under great strain. Though historians have recently attempted to paint Anne in a more favorable light, her history has long been tarnished by the memoirs of her longtime friend, Sarah Churchill, Duchess of Marlborough (Rachel Weisz). In The Favourite, we see Abigail (Emma Stone) arrive at court in dire straits. Recently of wealth and status, Abigail’s family has had a severe turn of fortune, and she seeks out Lady Sarah, apparently a cousin, for any kind of support she might be offered. We soon learn that Queen Anne is childlike in her demeanor and mental ability, and as fickle, insecure, and volatile as you might expect. Thus, Lady Sarah, as the Queen’s longtime confidant and adviser, rules the land for all intents and purposes. Masterfully manipulating and controlling the Queen is Sarah’s full-time job, which makes running a country especially difficult. Abigail manages to get on Sarah’s good side, slowly learns the ways of court (or at least, this court), and eventually comes to realize the true balancing act of daring to be near an all-powerful crazy person. Through the intrigue and drama, which Weisz handles almost unbelievably, we soon discover that we are only watching the education of Abigail, and few films have ever given us more solid ground from which to accept a characters transformation. It’s a screenplay obsessed with displaying the production of emotion and attitude, and to an extent that is at times jarring in its unfamiliar depth of dedication. Certain scenes and/or visual/thematic repetition seem inconsequential or unnecessary while they’re happening. Abigail’s conversations with nearly everyone who isn’t the Queen or Lady Sarah, including an opposition leader played to perfection by Nicholas Hoult, leap to mind. Lady Sarah’s nearly endless trek through the halls of the castle itself becomes maddening. Some of it is curious, some unsettling, but it all eventually coalesces into a picture of driftwood lost to the current, and the discovery that we were only watching the swirls and eddies all along is one of the most powerful reveals the world of film has managed in years. It may seem hollow, and indeed may produce a negative reaction, to call something “Shakespearean”, but I don’t mean to say that it is such in terms of value, but in its approach and theory. The subtle, and not-so-subtle, dissection and destruction of character, along with the wicked maneuvering, not only resides comfortably alongside any of Shakespeare’s tragedies (especially reminding of King Lear and Coriolanus), it holds its own in the company.